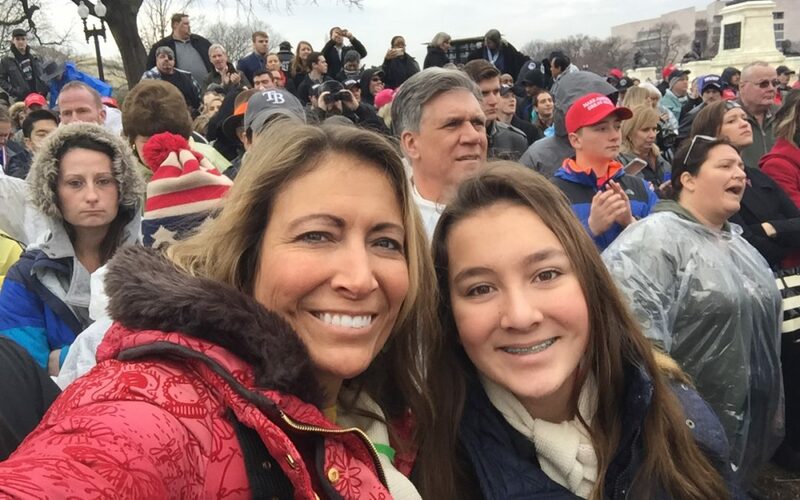 Terri Pickens and her daughter, 12-year-old Maya, at Donald Trump's inauguration Friday. They are participating in Saturday’s Women's March in Washington. Provided by Terri Pickens. WASHINGTON — Idahoans participating in Saturday’s Women’s March on Washington have one thing in common: They traveled more than 2,000 miles to the nation’s capital because they want their voices heard and their rights protected. There is no single profile of the Idaho women traveling to Washington for the event; they vary in age, occupation and background. Deborah Arment describes herself as a former activist in New York City now working as a sign language interpreter and living near McCall. She said her work has given her a heightened awareness of the issues facing those with disabilities and marginalized groups. After the election of Donald Trump, she said, she became worried those communities could lose certain rights. She said she is also marching out of frustration with Idaho’s elected officials, who are out of touch with residents’ needs, in her view. Karen Day, a freelance documentary maker and journalist who lives on a farm in Eagle, has made a career of showcasing other perspectives and working for positive change and gender equality. Day is attending the march with friend and fellow Idaho resident Karen Meyer, who protested the Vietnam War in the 1960s. She hopes the sheer scale of the demonstration will be enough to get the attention of elected officials. Now Pickens teaches her 12-year-old daughter, Maya, that she has the same rights and opportunities as boys. That’s why she’s taking Maya with her to the march, to experience thousands of women demanding that their voices be heard. On Nov. 8, Pickens watched as her hopes for a first female president were dashed. “The night of the election, my heart was broken. My daughter’s heart was broken,” she said. Instead of participating in one of the hundreds of local marches across the country, Pickens said she believes she has to be in Washington. “I need to be there so I feel like we’re being heard,” she said. Pickens and her daughter will be decked out in pussyhats — the pink knitted beanies with cat ears that have become the unofficial emblem of the march — along with pink sneakers and Planned Parenthood shirts.